Forum Post: Is identifying with Robin Hood a good idea? Michael Moore suggests we use humor during this revolution, a very serious event. What if Robin Hood was not just one person, but a group? The key for me would be in the terminology. I would not be for stealing from the rich, but I would be all for "taking" from the rich to give to the poor. Whether May Day, or the protests at the democratic and republican conventions, (where I hopefully will be participating), we could all be Robin Hood together. Adbusters has initiated a new campaign for a global march for this Saturday, Oct. 29 in support of the Robin Hood Tax. Oct. 29 is the eve of the G-20 summit in Southern France set for November 3 and 4. The Robin Hood Tax (or Financial Transaction Tax) is a type of sales tax on financial transactions, such as trades of stocks or bonds. This tax is good progress. A "Wealth" tax is also a good idea. Both are being discussed. Yes, but be sure to understand the role he had in the Magna Carta, which, is missing from our written history. Hmmm, maybe its not such a great idea if that role is not understood. I mean it was very violent, and now, the king has the "forest service", so it might not work out. Robin Hood had a role in the Magna Carta? Can you elaborate? Yes, but what do you already know about the charter? For example, did you know that the Magna Carta was a peace treaty? If so, which war did it end? I liked the phrase, "law of the land", which I believe inspired All Men are Created Equal and the Rule of Law. What about Robin Hood? Thumbs up or down? It is not that simple in the world of social impressions. There are fairly profound answers to the questions I asked that have deep implications to what Amersica is trying to do through this "occupy" movement. Those answers create framework for a proper answer to the Robinhood question. The Magna Carta ended a war between the Freemen and the barons, the knights and the king. More specifically in a general sense, the Freemen represented the Indigenous caucasion peoples of the area. The loosers signed the treaty and have been working to hide its existence and meaning since the day it was presented to them as the only conditions by where the Freemen would cease their attacks upon them. Are you aboard with this concept yet? The concept of understanding the symbol you ask about? Robinhood was a selected identity set into society to "occupy" a role, socially in history, the role of the Freemen. They were heretics, who do not exist and can have no written past as long as the church keeps the record. They worked with the unconscious mind. THAT is how they became powerful enough to force the king and barons to sign the charter. 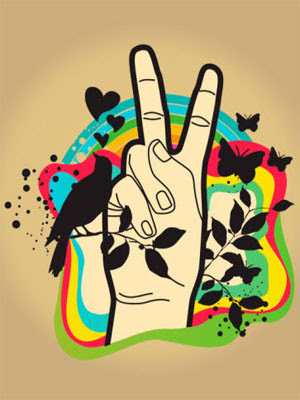 Wonder why the peace symbol always has the palm facing the viewer. It relates. Think of watching the act of releasing an arrow into the sky from the side of the archer that is releasing the string. When the fingers release the shaft to the sky, a "v" is formed with the release fingers which shows the back of the hand. That arrow will arc back to earth at 170mph. The forests with this, and other forms of warfare were ruled by this to gain the social contract which is the predecessor to the US constitution. The opposite is the peace symbol. I may have a long way to go to understand the "symbol" you're talking about but I know Robin Hood would be a well known name, and appreciated by the masses. Simply put, the "V" formed by fingers showing the back of the hand is war, showing the palm is peace. Google RObin Hood TAx...If you are in Tampa hit me up, we will hopefully have some very funny promotions going on.. I'm familiar with the Robin hood tax on trades. I'm in Pensacola and might take you up on the invite. "The key for me would be in the terminology." Like in 1984? I don't want to steal from anyone. Taxing very wealthy people to the point that they're only wealthy is a worthy goal. I understand. My customers are not spending money in my store because of the rise in gas prices. They simply don't have any money! Robin Hood did not take from the rich to give to the poor. He took from the taxes levied by the corrupt govt and gave it back to the poor who paid the taxes in the first place. That's what I had in mind when I used the word take. he gave the surfs food ? you mean the "serfs" ?